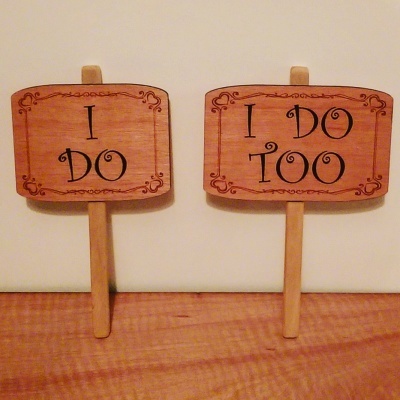 These wooden tags offer some guidance and gentle advice for the most nervous of grooms. Laser engraved detailing and hand painted before being hung on natural jute rope for easy hanging in place. Make them extra special with personalised messages for romance, humour or even a bit of support. Personalised options can be found in the variations drop down menu and names can be entered in the message to seller box at checkout. Each tag is approximately 6 x 4 cm in size. 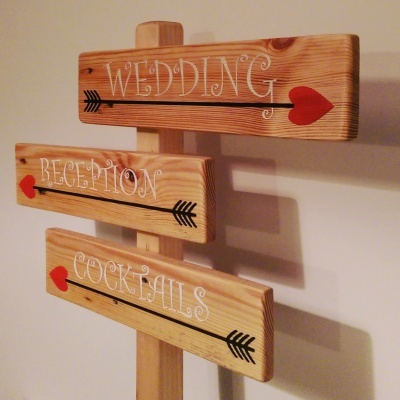 These handmade solid wood directional signs are sure to point your guests in the right direction in style. Deep laser engraved etchings make your wording and colours stand out against beautiful natural wood which has been oiled and varnished to protect against the elements come rain or shine. Each sign is made in true classic vintage style from sustainable rustic wood with a look that will compliment all kinds of themes. 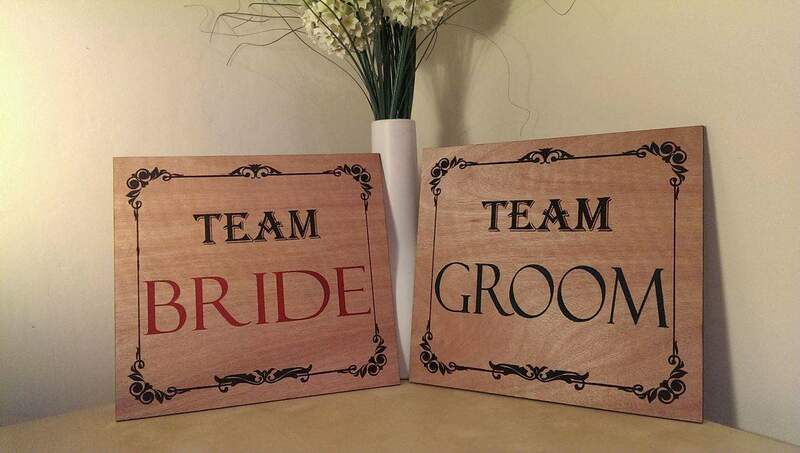 Each sign measures 40 cm in length by 9 cm in height, 1.5 cm thick and can be personalised with any wording your Special Day requires. For complete signage stands with multiple direction signs, use the contact page. These vintage inspired laser engraved photo props will add character and fun to your wedding photo collection and can be used by Brides, Grooms and even guests alike. A solid wood wood handle and the vintage scroll work alongside a chic font will compliment a variation of wedding themes. Each measures 32cm in height and 17/22cm in width. 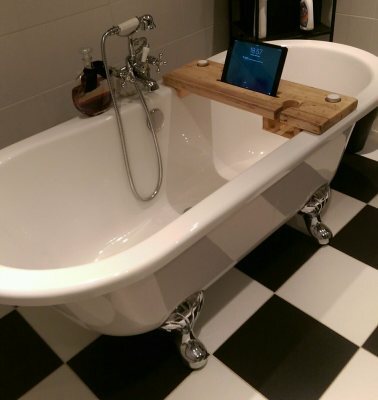 After a long hard day, unwind and relax in the tub with a book, a movie or even the match with this cool bath board. ​It will hold 2 tealight sized candles, your mobile device and of course a nice handy space and shelf for a nice glass of wine or a pint glass (Options available in the add to cart menu). ​Mobile devices up to 10.5 inches compatible. 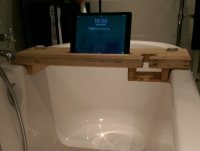 ​Use of mobile devices in the bath is at owners risk. These laser cut hand painted placards are a hit in lots of different settings. From photo booths to Stag and Hen partys or even as Aisle ends for your special day. 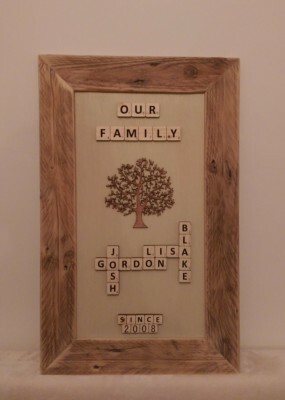 These solid wood scrabble style family trees are made to order and can be personalised with up to 10 hearts and names and year of choice. Chunky oversized solid wood scrabble pieces. Additional hearts can be added to your cart for £1.50 each. 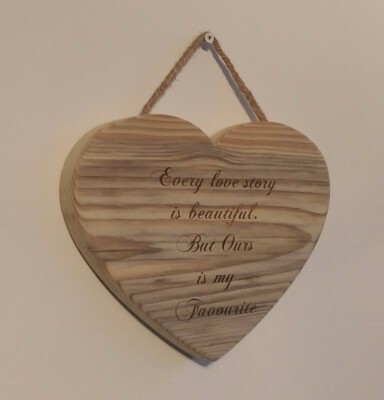 Choose from either natural wood or vintage white hearts at checkout. 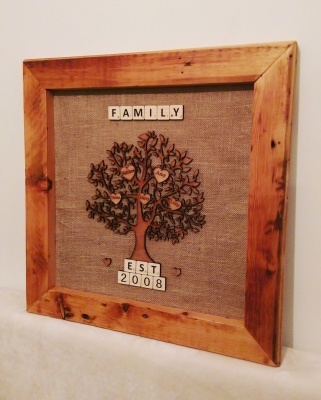 This family tree is laser cut from dark plywood and looks great against a country cream backgound. The oversize scrabble pieces and pallet board frame are made from 100% recycled and sustainable materials. All pieces are laser engraved and handpainted individually. 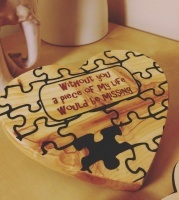 "Without you a piece of my life would be missing"
For an extra special finish, why not add your loved ones name in the missing piece. Each heart is made to order and measures 17 x 14 cm and is 2cm thick. 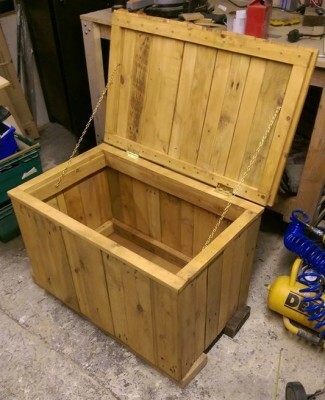 Available in a Natural wood finish or hand painted and finish in Danish oil to enhance the beautiful wood grains.
" 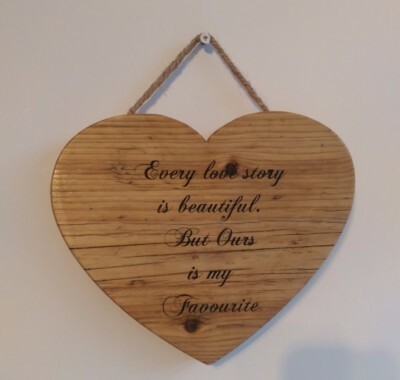 Every Love story is beautiful, but Ours is my favourite "
"Every love story is beautiful but ours is my favourite"
A beautiful quote laser engraved into one of my handmade solid wood heart shaped slabs of reclaimed wood. Every piece is unique in its own right and is handmade with attention to detail before being laser engraved and hung on thick natural jute rope. A beautiful gift for Valentine's Day, birthdays, anniversaries or even just to remind someone just how much you care for them. All my wall hangings are made from 100% recycled materials which are sourced by myself. Oiled and painted options are hand painted and finished with high quality Danish oil and personalised options allow for a maximum of 30 Characters. For other personalisation of my heart shaped plaques, please feel free to use my contact section for a bespoke design enquiry. 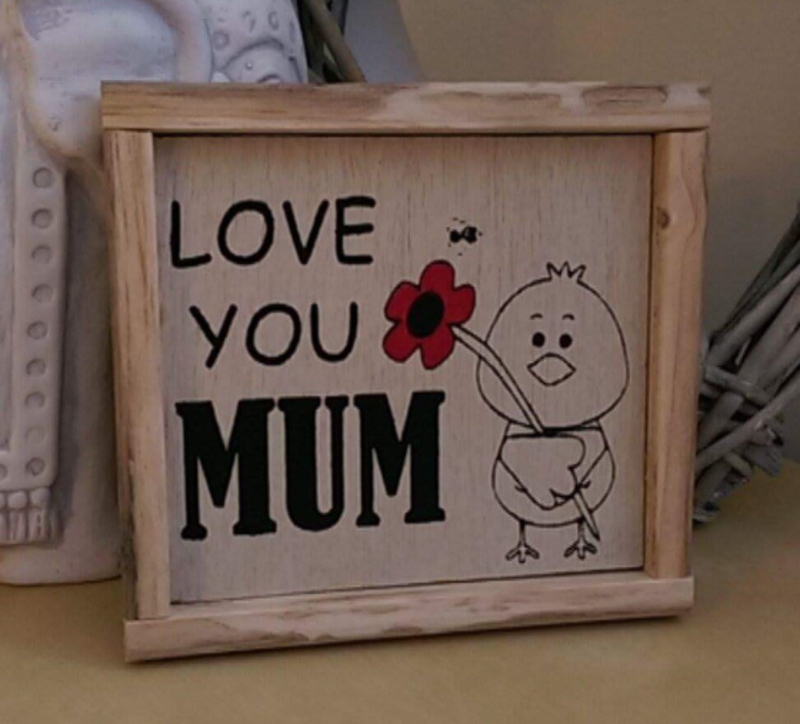 This cute picture frame is an ideal gift for your Mum. Laser engraved and hand painted. 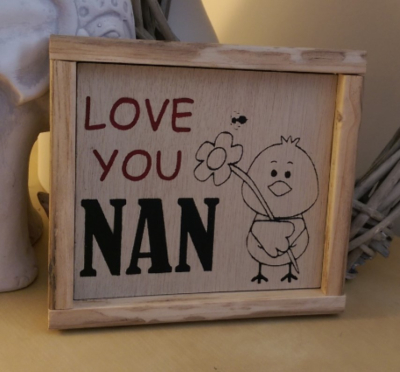 This cute picture frame is an ideal gift for Nans of all ages. 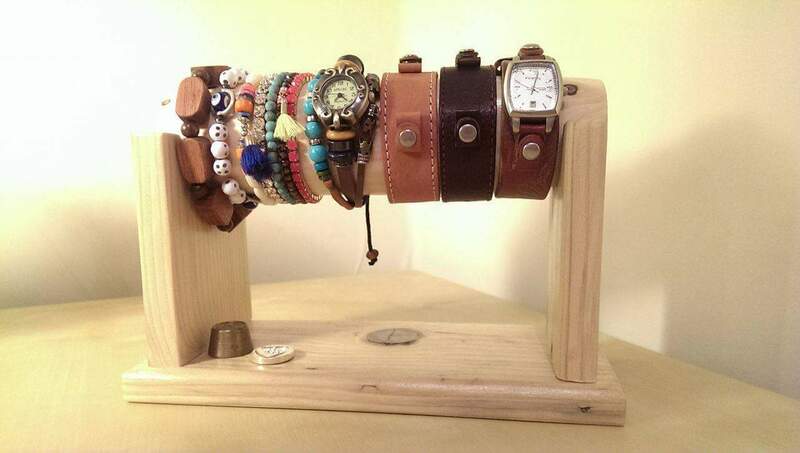 This organiser is perfect for storing your watches, bangles and other favourite pieces of jewellery. Made from a single solid thick log which nestles between a chunky rested stand, it will look beautiful on any dressing table or bedside . Finished in clear glaze varnish for durablity. This jewellery organiser is perfect for storing your watches, bangles, bracelets and other favourite pieces of jewellery. 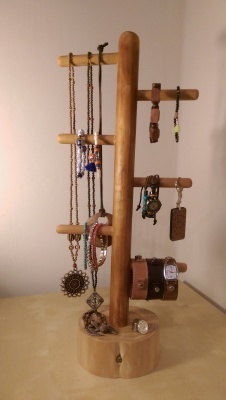 Larger than most other jewellery hanging trees to prevent snagging and tangling of your jewellery or products. Made from solid hard wood with 6 chunky hand sculpted hanging bars it will look beautiful on any dressing table, bedside table or shop counter. Finished in high quality danish oil. BUY 2 Get 1 HALF PRICE! 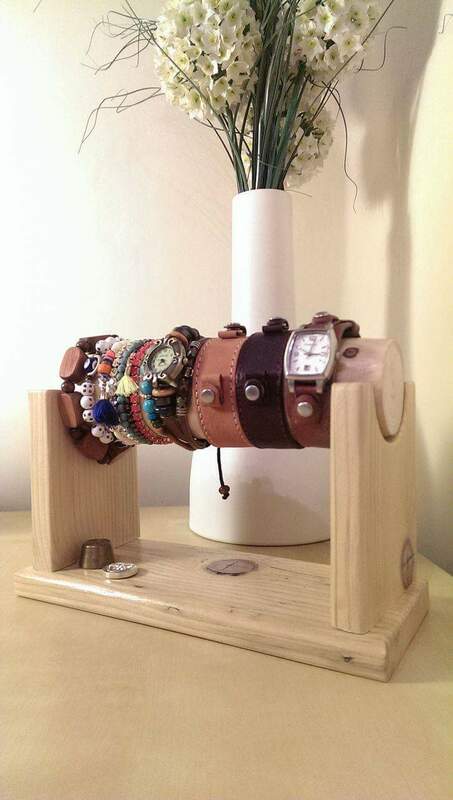 For other enquiries or a bespoke handmade design, please feel free to contact me using the contact section. 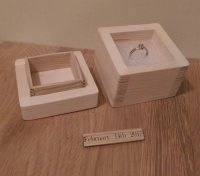 These solid wood hand made ring boxes are a perfect way to compliment that extra special proposal, gift or offering. Each box is hand made to order and comes with a soft foam liner to hold your ring in place to ensure it is presented in the finest way possible. 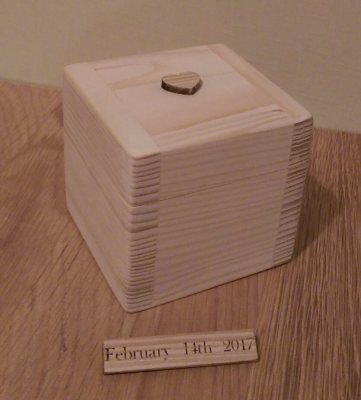 A single solid wood heart tops each box and can be personalised with the name, date or message of your choice to truly personalise the moment you will both remember and cherish forever. 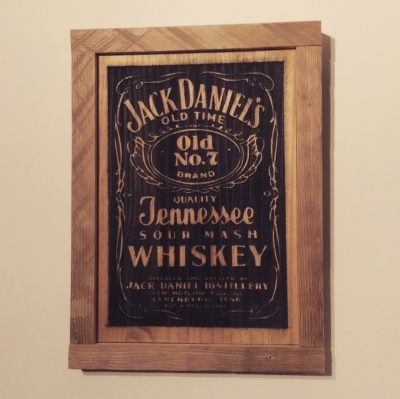 These rustic vintage style Jack Daniels wall hangings are made from solid wood throughout. A solid slab has been laser engraved and painted to give an aged authentic look before being oiled to preserve its beauty. The solid chunky frame is made from rustic sustainable timber sourced by myself from various reclaimation jobs and look fantastic in all manner of settings. A must for bars, restaurants, home or just even in your man cave or chick pit. 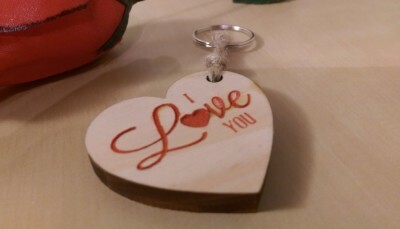 Valentines day gift solid wood door hanger. These solid wood door hangings are laser cut, engraved and hand painted. They make great gifts for the special person in your life to get things ready for Valentines night and ensure you get the private time you deserve. Each door hanging measures 18 cm in length and is 7 cm wide. Looking for something a bit more personal? Use the personalised section in the variations to add a personalised message up to 30 characters. 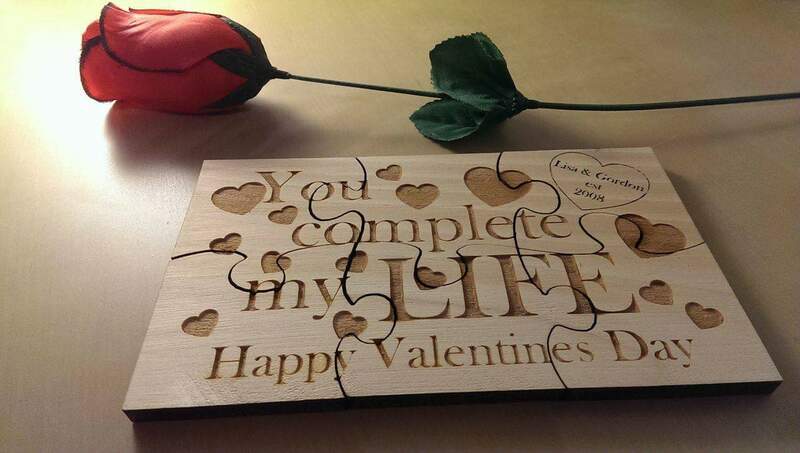 These personalised jigsaws are a beautiful way to show the love of your life just how special they are to you. 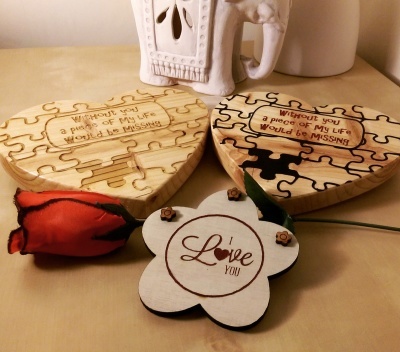 Personalised with your names and a special commemorative date laser engraved and hand painted in each jigsaw make these gifts extra special. 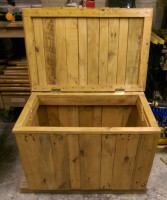 This Solid reclaimed and pallet wood chest is guaranteed to give plenty of storage in a variety of settings. Either at the foot of the bed for bed linen , a tool store or even as a heavy duty solid toy box. Whatever you use it for, you'll be glad you bought one! 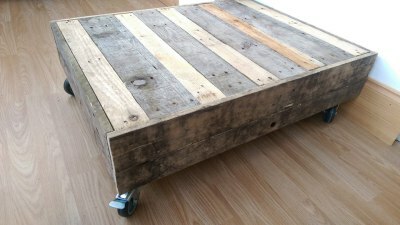 This rustic industrial style coffee table has a large open base for newspapers and magazines. Multiple supports under its tabletop and base make this table as strong and durable as they come finished in a hard wearing clear stain. 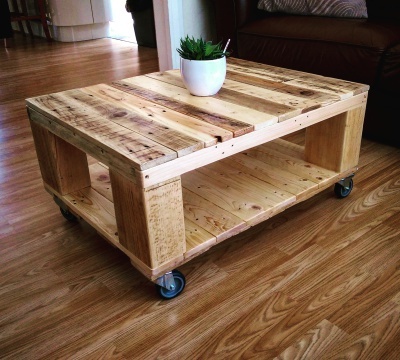 Constructed from reclaimed pallet boards with solid chunky corner supports and brushed steel swivel castors it will look fabulous in any setting. Available in a range of stains and colours. 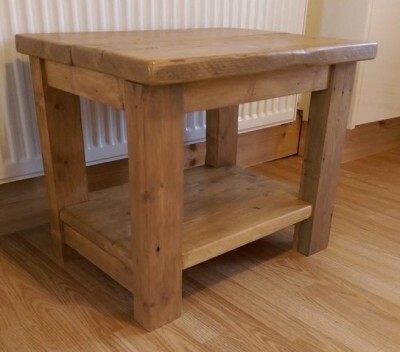 This Solid Oak side coffee table is hand made from reclaimed timbers using traditional mortice and tenon joints creating a solid structure for its frame. 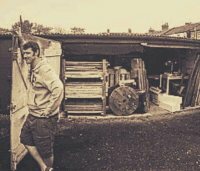 Each piece of solid reclaimed oak has been gently planed and sanded prior to construction creating a fresh but authentic feel while rustic markings and imperfections capture the individuality and history of each tables origin. A beautiful piece of furniture that will last and look great for years. This table will look great in living space's, conservatories, bedrooms, man cave's and many other spaces. This cool rustic low level coffee table on swivel top plate castors is ideal for living spaces, bedrooms, man caves or chick pits and just about anywhere else. Use our contact form for bespoke designs. 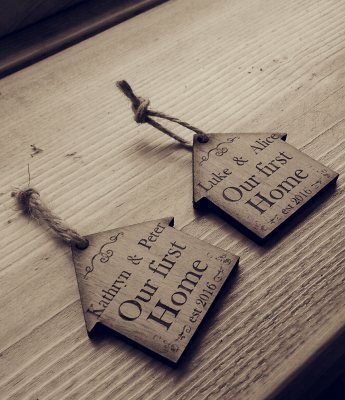 These personalised keyrings are made to order and are a beautiful way to share a unity of two people sharing their first home together. Each is personalised with the name of either your names as a couple or individual name's on each keyring. Each keyring is cut from sustainable reclaimed wood and hung on either durable jute or a keychain and ring (both supplied). 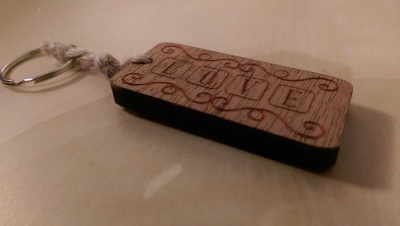 Solid wood keyrings to send the most important message to your loved one this Valentines Day. Each is laser engraved and cut before being hand painted. Each keyring is 5 cm at its widest point and comes hung on either jute rope and ring or a keychain and ring.